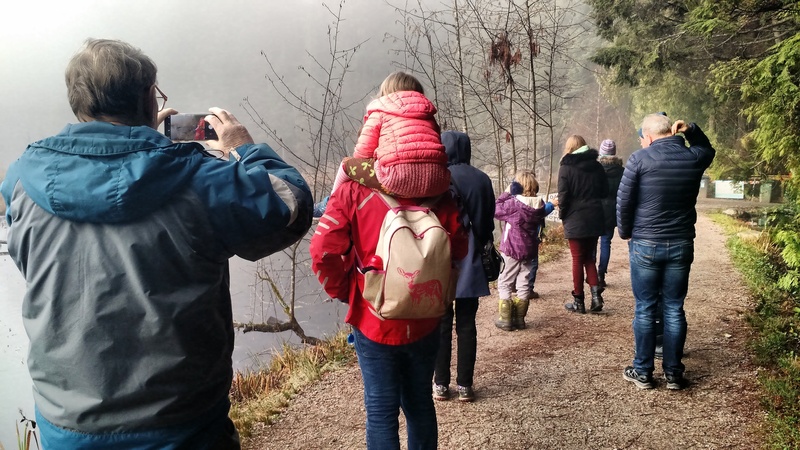 This Saturday morning, December 1, 2018, children will swap their screens for binoculars to count birds in Stanley Park as part of an event hosted by Bird Studies Canada, NatureKids BC and Stanley Park Ecology Society. The Christmas Bird Count for Kids (CBC4Kids) helps kids and their families learn about wild birds in our neighbourhoods and contribute to a nation-wide citizen science project while spending valuable time in nature together. Now in its 8th year in Canada, this popular family event helps create an annual snapshot of how the birds in our parks and other natural spaces are doing during the months of December and January while highlighting any bird species that need our help. Coordinated nationally by Bird Studies Canada, fun and family-friendly CBC4Kids events are hosted by naturalist groups all across Canada as an exciting way for youth to learn about winter birds, build identification and monitoring skills, and connect with local birding communities. Last season, 142 different bird species were reported from 58 CBC4Kids events across Canada. Stanley Park is a haven for birds and birdwatchers at all times of the year, but especially so during the colder months when our mild temperatures and rich coastal habitats act as a magnet to seabirds and songbirds that flock here to escape the worst of the Canadian winter. While birds can be spotted in all corners of the park at this time of year, one of the real spectacles is the huge flocks of ducks that feed on clams and mussels on the seashore around Stanley Park: surf scoters, Barrow’s goldeneyes and many others. The event takes place from the Stanley Park Pavilion (2nd floor) on Saturday, December 1, 2018, from 10 am to 12.30 pm. It starts with a short indoor training session after which the participant families will be divided into survey groups led by experienced birders. All bird sightings will be submitted to the eBird database, where the data will help inform conservation research. The event is free to attend for families but registration is required at https://cbc4kids2018.eventbrite.ca. CBC4Kids was established in 2007 by Sonoma Birding in California. Bird Studies Canada joined as the Canadian partner in 2010 and events are organized by groups and organizations all across Canada. To learn more about the Christmas Bird Watch for Kids event, watch this video or visit Bird Studies Canada’s website to learn about other CBC4Kids events or how to organize your own event. NatureKids BC is grateful to the Habitat Conservation Trust Fund, TD Friends of the Environment and Nature Canada supporting our involvement in the Christmas Bird Count for Kids events. NatureKids BC will host at least 10 Christmas Bird Count for Kids events across BC in December and January. No Replies to "Kids Swap Screens for Binoculars to Count Birds"